Yesterday, I got a chance to see this tweet which lists below four things as "MBA in Tweet". I believe every Entrepreneur should follow these 4 things to achieve success in their mission. Sell products/services that solve people's problems. 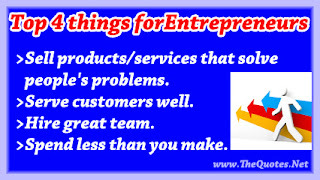 We can find lot of articles giving various advices for Entrepreneurs. For example, this article is listing 25 Common Characteristics of Successful Entrepreneurs. But, I can say that remembering and following just these 4 things is enough to succeed in our business. I realized this fact from my personal experience. I have started our company "QualityPoint Technologies" in the year 2008 with great vision of "To be the Global Technical Leader by using latest technologies effectively and also by introducing innovative solutions while keeping Employees and Users happy" and values of "Honest and Hard work. Delivering Quality Product on time cost effectively". We have done a lot of things to develop our company. We have successfully completed more than 120 projects for our clients, and the happy customers are willing to give more work. And, as explained in this blog post, we have taken lot of initiatives to develop our own products and web portals. But still, we are NOT seeing the expected growth. So, I am doing a lot of analysis and study to understand the reasons for the delay of our company growth. Based on this study, I came up with a list of things that need to be addressed immediately with high priority to accelerate the growth. And, I am addressing those things step by step. When I saw this "MBA in Tweet" tweet, I felt that these 4 things are exactly matching with my list of findings. So, I wanted to share this fact with my blog readers through this blog post. I believe every one will accept the importance of these 4 things. Share your thoughts through the comments if you have different opinions. Let me explain how I am addressing these 4 things to accelerate our growth. Let me start explaining from the bottom. i-e 4th point "Spend less than you make." I wanted to start from this 4th point because it subsequently affects other things also. I agree that it is important to do investment for starting any business. But if we are not making money more than our spending (without including initial investment) within a few years, it clearly indicates there is some issue in our business model. For example, our Chennai office was making less than the expenditures for a long time irrespective of the fact that we had enough work to do. The obvious reason is high employee attrition rate. So, I closed our Chennai Office as explained here. After closing our Chennai office, I am having enough time to focus on a lot of other things that are required for our company growth. So, addressing 4th point will help to accelerate the company growth apart from helping you to save money. Don't confuse this 4th point with the intentional/planned spending. For example, I am spending a lot of money and energy to develop and promote our motivational quotes website TheQuotes.net for many years without getting any returns. It doesn't mean that I have to stop spending further. Because I am spending on this site intentionally/knowingly with a clear plan and strategy. Based on my study/analysis, similar Quotes sites are earning in millions. And, I believe I can make our site to bring on bar with those sites using our Development and SEO skills. So, I can say that I will be getting all my spendings as returns within a few months once our site starts earning money. This plan is not having any major risks. So, we should not confuse these kinds of situations with the 4 th point. Anyway, unless you are having any specific reason for your spending, always Spend less than you make. The next important thing is "Hire great team." Everyone will agree with this third point. But implementing this point in practice is bit difficult. Previously we had many great Team members in our Chennai Office, but the overall Team performance is not up to my expectation. The reason is, we had some team members with average performance. It affected entire team performance even if we had excellent team members. So, hiring few great team members is not enough, we have to hire Great Team i-e All Team members should perform well, and they should have Team Spirit. So, give more importance for hiring great Team. If you couldn't find great Team members, it is better not to hire anyone instead of hiring some average or low performing candidate. I have learned this lesson with great expense. For example, my wrong hiring of few candidates resulted in Penguin attack of our Motivational Quotes website TheQuotes.net. I am still working hard to recover from this Penguin attack for more than a year. But still not seeing significant improvement in the search rank. So, now I am very specific about hiring good team members. One employee from our Ottapidaram office had resigned two months back. Still I am looking for suitable candidate to replace that position. I don't want to compromise this great advice "Hire great team." The second point is "Serve customers well." I need not explain this one. Wal Mart founder Sam Walton says, There is only one boss. The customer. And he can fire everybody in the company from the chairman on down, simply by spending his money somewhere else. So, we need to serve customers well. It will be possible only if you have a Great Team which follows your instructions about taking care of customers. The first thing is "Sell products/services that solve people's problems." Yes, your product should solve the actual problems of the people. There is no use if it doesn't solve people's problems even if you have excellent products and a great team to support the product. Initially, I did a lot of initiatives and plans to develop lot of products. And, I had more than 25 websites. Now closed many websites and dropped many products. Right now I am focusing on a few products that really solve people's problems. For example, I focus on selling our Timesheet which will be very useful in solving employee performance and productivity issues of any start-up. And, I am planning to focus on our AutoResumePost product soon. It will help candidates to save a lot of time when doing a job search. So, personally I strongly believe in all these 4 things and I am seeing good changes after start implementing these 4 things strongly. I recommend the budding entrepreneurs to follow these things. You can share your experience thro' the comments.